Your water heater is one of the most important parts of your household plumbing installation. Without it, your washing machine and dishwasher would be virtually useless – and imagine having to take an ice-cold shower every day. That means that a breakdown in your water heater is mission critical, especially in the winter. You can forestall emergency, however, by keeping an eye on how your equipment is functioning and performing preemptive maintenance in the event you spot any signs of trouble. Read on for some tips on how to know when your water heater is on the fritz. No piece of equipment lasts forever. Winter can be especially hard on hot water heaters, because their metal tanks can expand and contract if your plumbing installation is located in an unheated basement or other area that experiences severe temperature fluctuations. The amount of mineral content in your water supply can also play a role in reducing the lifespan of your unit. Look for drips, leaks or accumulated water underneath your hot water heater. Check out the flame if you use a gas water heater – it should burn mostly blue, not yellow. Take note if the water in your shower is either too hot or too cold, or doesn’t reflect the temperature to which the water heater is set. Rust coming out of your faucet could be a sign that your heater needs help. Also keep an eye out for any bending or cracking in the water heater tank, which could be an indication that it’s time to buy a replacement. 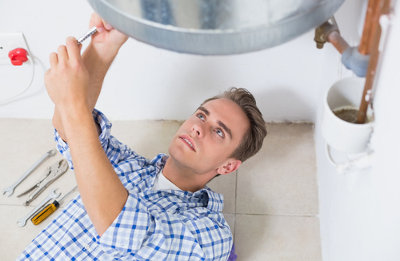 In some cases, savvy DIYers might be able to take on water heater repairs on their own – replacing a faulty heat unit, for example – but most attempts at fixing or replacing the plumbing installation need to be handled by a qualified professional. Unfortunately, total water heater replacement tends to be an expensive job. However, the good news is that federal regulations mandate that new water heaters be more efficient than ever, meaning you can make up some of your investment in energy savings over time. Make sure you figure out your first hour rating before you start shopping so you can purchase the unit that best meets the needs for your family. If you need work done on your hot water heater or any other plumbing installations, contact a qualified plumber without delay.